Here is what's on in Melbourne in November. November in Melbourne is the height of the spring racing season. After that the major event calendar of Melbourne is relatively quiet. But life goes on in the nooks and crannies of Melbourne subcultures. It is time to get organized for Chrismas shopping - and Melbourne is definitely the place to get original items, from fashion and accessories to art and craft bits and pieces that are made to enjoy. A great place to start is one of Melbourne's art and craft markets. Hats, fashion, glamour and horses. 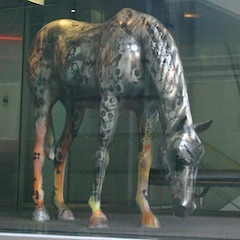 The legendary Melbourne Cup, is held on the first Tuesday in November. It is an opportunity for the fashionista the show off the lates frogs and fascinators, and an opportunity for a long weekend for many as it is a public holiday in Victoria. The Village festival is everything but mainstream. It is cutting edge, eccentric, feisty, communal, intimate. 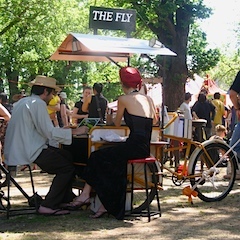 It is held in a tent 'city' in Edinburgh Gardens in Fitzroy North and offers a program of comedy, theatre, music, visual art, audience participation and games. It includes a 'dog show', a dance competition and peoples show, a swap shop. Altogehter great fun. The Southgate Fiesta is the celebration of the new Southgate complex on the Southbank Promenade with sunset salsa dance classes, live music, spectacular aerial and street theatre performances, insider restaurant and retailer tours, special offers, new cutting-edge entertainment and more - topped off by evening rooftop fireworks! This City of Melbourne event showcases over 65 events showcasing some of the best emerging and established local and international artists. There are live-performances, DJs, kid's programs, workshops designed to empower people involved in the music industry. The Queenscliff Music festival is a well-loved and cherished music event, just over an hour out of Melbourne, right at the bottom of Port Phillip Bay, in Queenscliff. It attracts a dynamite lineup of artists from Australia and overseas, with a special leaning towards world-music and soulful entertainment. These are some highlights of What's on in Melbourne in November. The spirit of Melbourne comes to live in its many community events, bars and live performances, which are too numerous to be listed here.